A public university is a university that is predominantly funded by public means through a national or subnational government, as opposed to private universities. Whether a national university is considered public varies from one country (or region) to another, largely depending on the specific education landscape. In some parts of the world (such as China), public universities usually enjoy higher reputation domestically. Many of the prominent public universities are ranked among the best in the world by THES - QS World University Rankings and the Academic Ranking of World Universities. 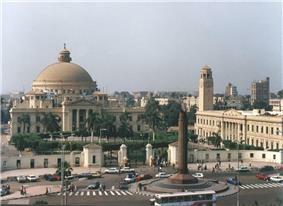 In Egypt, Al-Azhar University opened in 975 AD as the second oldest university in the world. It was followed by a lot of universities opened as public universities in the 20th century such as Cairo University (1908), Alexandria University (1912), Assiut University (1928), Ain Shams University (1957), Helwan University (1959), Beni-Suef University (1963), Benha University (1965), Zagazig University (1978), Suez Canal University (1989), where tuition fees are totally subsidized by the Government. In Kenya, the Ministry of Education controls all of the public universities. Students are enrolled after completing the 8-4-4 system of education and attaining a mark of C+ or above. Students who meet the criteria for government sponsorship receive a loan from the Higher Education Loan Board. They are expected to pay back after completing higher education. South Africa has 23 public tertiary educational institutions, either categorised as a traditional university or a comprehensive university (providing theoretical and vocational training). Prominent public South African universities include the University of Johannesburg, University of Cape Town, North-west University, University of KwaZulu-Natal, University of Pretoria, University of Stellenbosch, University of Witwatersrand, Rhodes University and the University of South Africa. 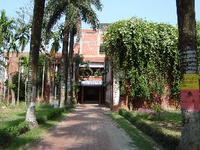 There are 35 public universities in Bangladesh. The University Grant Commission is the governing body for all the public universities in Bangladesh. The universities do not deal directly with the government, but with the University Grants Commission, which in turn deals with the government. Recently many private universities are established under the Private University Act of 1992. In mainland China, nearly all universities and research institutions are public and currently, all important and significant centers for higher education in the country are publicly administered. The public universities are usually run by the provincial governments; there are also circumstances where the municipal governments administer the universities. Some public universities are national, which are directly administered by the central government. Private undergraduate colleges do exist, which are mostly vocational colleges sponsored by private enterprises. The majority of such universities are not entitled to award bachelor's degrees. Eight institutions are funded by the University Grants Committee. The Academy for Performing Arts also receives funding from the government. The Open University of Hong Kong is also a public university, but it is largely self-financed. The Shue Yan University is the only private institution with the status of a university, but it also receives some financial support from the government since it was granted university status. 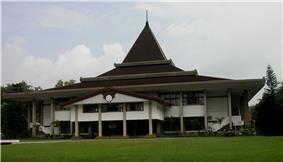 There are public and private educational institutes in Indonesia. The government (Ministry of Research, Technology, and Higher Education) provide public universities, institutes, high schools and academies in each province. The private educational institution usually provided by religious organizations, public organizations, and some big companies. In India, most universities and nearly all research institutions are public. There are some private undergraduate colleges, mostly engineering schools, but a majority of these are affiliated to public universities. Some of these private schools are also partially aided by the national or state governments. India also has an "open" public university, the Indira Gandhi National Open University (IGNOU), which mostly offers distance education, and in terms of the number of enrolled students is now the largest university in the world . Some of Iran's prestigious universities are public. State-run universities are highly selective. Iran's best known private university is Islamic Azad University with campuses all around the country. It is one of the largest universities in the world. There are eight official universities in Israel. In addition, there are a few dozen colleges and other institutes of higher learning, as well as about a dozen foreign university extensions. All are academically supervised by the Council for Higher Education in Israel (CHEI). The main difference between a university and a college in Israel is that only a university can issue doctorate degrees. Theoretically, a college can apply to the CHEI to upgrade its status to university. In Japan, public universities refer to schools that are not national universities but are run by local governments, either prefectural or municipal. According to the Ministry of Education, public universities have "provided an opportunity for higher education in a region and served the central role of intellectual and cultural base for the local community in the region", and are "expected to contribute to social, economical and cultural development in the region"; this contrasts to research-oriented aspects of national universities. As of 2010, there were 95 public universities, compared to 86 national universities and 597 private universities, and 127,872 students attended the schools. The number of the public universities has increased sharply in recent years; in 1980 there were only 34 public universities and in 1993 there were 46. Since July 2003 when the Local Independent Administrative Institutions Law was put into effect, public universities have been allowed to be incorporated. The average tuition in public universities for 2007 fiscal year was 536,238 yen, the average entrance fee 399,351 yen and the average application fee 17,095 yen. Manas University, the public university in Kyrgyzstan, is the public higher education institution which offers associate degrees, undergraduate degrees, and graduate and post graduate degrees. University of Macau is the only public university in Macau. Also, the Macau Polytechnic Institute and Institute for Tourism Studies are the public educational institute which can offer undergraduate education. There are 20 public universities in Malaysia, which are funded by the Government but governed as self-managed institutions. Tribhuvan University is the first public university of Nepal. The university is highly reputed both in Nepal as well as abroad, and runs various programs in a wide number of academic disciplines. It operates through six different schools, and also provides affiliation to various colleges across the country. Kathmandu University is also the public university of Nepal founded by government act in 1991. Due to high fee and single person's administration, many people think that this university is a private university, but it is not (see kathmandu University type). The university offers new and demanding subjects especially in the field of science and technology through different schools. In Pakistan, universities receive guidance and are partially regulated by the Higher Education Commission of Pakistan (HEC) (formerly the University Grant Commission). There are around 67 public and 57 private universities in Pakistan. The University of Punjab is the biggest public university followed by the University of Karachi. 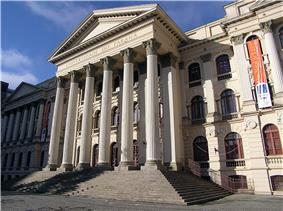 Universities and colleges in the Philippines are controlled and managed by the Commission on Higher Education, with the exception of the University of the Philippines. There are more than 500 government-run higher education institutions, of which 436 are state colleges and universities, including satellite campuses, 31 local colleges and universities, and a handful of community colleges. In 2008, through Republic Act 9500, the University of the Philippines was bestowed as the National University to distinguish it from all other state universities and colleges. Aside from the University of the Philippines, there are other notable state colleges and universities within the archipelago. These include the Polytechnic University of the Philippines, Technological University of the Philippines, Philippine Normal University, and Mindanao State University. In 2008, state colleges and universities have a PHP 26.2-billion budget, out of which PHP 19.4 billion will be funded by direct subsidies. In Sri Lanka all universities are public universities with most funded by government via the University Grants Commission which handles undergraduate placements and staff appointments. Therefore, these are not independent institutions. Taiwan has more than 150 universities (2/3 were established after the 1980s), while only 1/3 of them are public universities. Tuition fees at public universities are less than half those of private universities because the Taiwan government puts more funding to the public universities. Additionally, there are 10 public universities (established before the 1980s) are more accredited and more prestigious in Taiwan and the majority of top-ranking schools are public. Therefore, most students choose public universities for their tertiary education. Currently, Thailand has 24 public universities. In the late 19th century, there was a high demand for professional talents in the central government of Thailand. Siam was an aftermath of King Rama V's bureaucratic reforms, which aimed to transform the feudal Thai society into a modernized state. 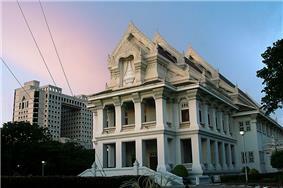 In 1899, the King founded the School for Training of Civil Officials (Thai: โรงเรียนสำหรับฝึกหัดวิชาข้าราชการฝ่ายพลเรือน) near the northern gate of the Royal Palace. Those who graduated from the School would became royal pages. Being royal pages, he must learn how to administrate organization by working closely with the King, which is a traditional way of entrance to the Siamese bureaucracy. After being royal pages, he would then served in the Mahattai Ministry or other government ministries. In Austria, most of the universities are public. The tuition fees are also regulated by the state and are the same for all universities. Except for some studies, notably medicine, everybody who fulfills the condition of a secondary degree is allowed to attend a public university. Private universities have existed since 1999, but they still need state accreditation. In Denmark, almost all universities are public and are held in higher esteem than their private counterparts. It is free to go to University in Denmark. In Finland all universities are public and free of charge. In France, most higher education organizations (universities and grandes écoles) are public and charge very low tuition fees (around €400 per year). Major exceptions are business schools such as HEC School of Management. In Germany, most higher education institutions are public and operated by the states and all professors are public servants. In general, public universities are held in higher esteem than their private counterparts. From 1972 through 1998, public universities were free of tuition fees; since then, however, some states have adopted low tuition fees. In Greece, all universities are public and enjoy de jure institutional autonomy, although in practice this autonomy is limited by ministerial interventions in issues such as student enrolment, academic recruitment and funding. With the exception of the Hellenic Open University, undergraduate programmes are offered tuition-free for Greek citizens, as are many post-graduate courses. Education is regarded as a constitutional responsibility of the state and the establishment of private universities is prohibited by the constitution. The article of the constitution regarding education was voted by the current parliament as one of those that will be amended by the next elected house of parliament. It is the intention of the current government to allow the establishment of private universities and recognize already existing private colleges as higher education institutions. In Italy, almost all the universities are public, but they enjoy de jure institutional autonomy (limited by the state in practice, like in Greece). The majority of the funds came from the state and, therefore, students pay quite low tuition fees, decided by each university and related mainly to the student's family wealth, to the course and to the student's performances in the exams. A few scholarships, both at undergraduate and postgraduate level, are also available for the best low-income students. Private funding, even for research, ranges from low to non-existent, compared to most other European countries. In The Netherlands, almost all universities are public and are funded by the Ministry of Education. Even though, Dutch citizens and citizens of other European Union countries are subject to a tuition fee of approximately 1,800 euros per year. Non-European students have to pay the 'legal school fee', which approximately is between 7,000 and 8,000 euros a year. All universities are supervised by the Ministry of Education, even the private ones. In Norway almost all universities are public and state funded. In Poland, universities are divided into a few categories; private universities which are operated by private citizens, societies or companies, and public universities created by Acts of Parliament. The Government pays all tuition fees, and other costs of students. Most private universities charge tuition fees directly to students, and these institutions are generally held in lower regard than public universities. A small number of private universities do not charge fees, such as John Paul II Catholic University of Lublin, founded in 1918 and property of the Roman Catholic Episcopacy of Poland; the Polish Government pays all costs. In Portugal, there are 13 public universities, a university institute and a distance university. Higher education in Portugal provided by state-run institutions is not free, as a tuition fee must be paid, although being much lower than the tuition fees of the private ones. The highest tuition fee allowed by law in public universities was 901.23 euros/year (2007). The public universities include some of the most selective and demanding higher learning institutions in the country, noted for high competitiveness and nationwide reputation. In Spain there are a total of 74 universities. Most of them (52), including the most prestigious ones, are public, and are funded by the autonomous community (i.e., the federal state) in which they are based. As such, university funding may differ (though not significantly) depending on which Spanish region the university is based on. However, the central government establishes by law homogeneous tuition fees for all public universities, and as such university fees are much lower than those of their private counterparts. The highest tuition fee allowed by law was, as of 2010, of 14.97 euros per academic credit, amounting to roughly 840 euros/year for an average 60 credit full-time course; tuition fees in private universities might reach 18,000 euros/year in comparison. Public universities are state-owned but granted a considerable degree of independence when it comes to self-government; they cannot, however, make free use of their assets (i.e., buy and sell assets as a private company would), and are subject to Spanish administrative law as any other public body of the state. In turn, public university administrators, lecturers and professors are granted civil servant status, which serves as a tenure because only under exceptional and very well justified circumstances can a civil servant lose his job under Spanish law. Research funding can be allocated either by the autonomous community or by the central government; in the former case, funding amount and conditions vary greatly from one autonomous community to another. In Sweden most universities are public. Education in Sweden is normally free, so there are no tuition fees at any university in Sweden. In Ireland, nearly all universities, institutes of technology, colleges of education and some other third-level institutions are public, and the state pays the cost of educating its undergraduates. There are a few private institutions of higher learning, for example the National College of Ireland but none of them have university status and they are highly specialised. In Russia, about 7.5 million students study in thousands of universities. In Turkey, many of the most renowned universities are public such as the Middle East Technical University, Boğaziçi University, Istanbul Technical University, Istanbul University, Yıldız Technical University, Kahramanmaraş Sütçüimam University (KSU), Karadeniz Technical University, Hacettepe University, Kilis 7 Aralık University and Anadolu University. For academic year 2013, there are 174 universities and academies total in Turkey: 103 of them are State Universities (five of which are technical universities, two of which are institutes of technology, and one of which is fine arts university). Turkey's higher learning institutions, governed by Ministry of Higher Education or YOK Ministry, are accepting more and more international students. Of the current 66 private foundation universities(seven of which are two-year granting institutions). In addition, there is a category called "special" including four military academies and one police academy. In the UK, an institution can only use the title "University" or "University College" if it has been granted by the Privy Council, under the terms of the Further and Higher Education Act 1992. Prior to 1992, these titles were conferred by Royal Charter, Act of Parliament, or (for the ancient universities) customary usage. Most British universities are partly publicly funded and regulated: the government regulates their tuition fees, student funding and student loans and commissions and regulates research assessments and teaching reviews. Unlike in Continental European countries, the British government does not own universities' assets, and university staff are not civil servants: government regulation arises as a condition of accepting funding from bodies such as HEFCE and any university can in principle choose to leave the HEFCE regulated system at any time. Since September 2012 government funding for teaching and background funding for research has been substantially reduced, with one study indicating that annual Government funding for teaching and research will make up just 15% of universities' income by 2015. As of 2014, funding council grants make up 15-19% of the income of universities as disparate as UCL (large research university, income £1 billion), Durham (small research university, income £300M) and Hertfordshire (teaching focused university, income £240M). However currently there are only a small number of fully fledged private universities in the United Kingdom. In Scotland, the first degree studied is free and paid for by the Scottish government. There is also a change of direction funding in which a student can change course or degree after a year without imposing financial penalties or having to pay extra. In Canada, education is a constitutional responsibility of the individual provinces. Many early universities were privately endowed (e.g. McGill) or founded by church denominations (e.g. Laval, Saint Mary's, Queen's, Dalhousie, Mount Allison, McMaster, Ottawa) but in the 20th century became publicly funded and secular. Provincial governments established the University of Toronto on the Oxbridge model and elsewhere (Alberta, Manitoba etc.) in the pattern of American state universities. All major Canadian universities are now publicly funded but maintain institutional autonomy, with the ability to decide on admission, tuition and governance. The McGill University and the University of Toronto are members of the Association of American Universities, along with sixty public and private institutions in the United States. Private universities in Canada are relatively new and mostly exist at the undergraduate level. University of North Alabama, Florence, Alabama, an example for public universities expanding into comprehensive state universities. In the United States, most public universities are The College of William & Mary (founded in 1693 and first considered private). The University of South Carolina (1801) is the longest continuously supported public university. Every U.S. state has at least one public university to its name and the largest states have more than thirty. This is partly as a result of the 1862 Morrill Land-Grant Acts, which gave each eligible state 30,000 acres (120 km²) of federal land to sell to finance public institutions offering courses of study in practical fields in addition to the liberal arts. With the help of the Civil Rights Act of 1964, the Higher Education Act of 1965 and the Education Amendments of 1972, public universities became even more accessible for women, minorities and lower income applicants. Several examples of state-funded universities considered to be top-tier on a worldwide basis can be found in the University of California system. Their top institutions include San Diego, Los Angeles (UCLA), and Berkeley. Many U.S. public universities began as teacher training institutions and eventually were expanded into comprehensive universities. Examples include UCLA, formerly the southern branch of California State Normal School; Arizona State University, originally the Tempe Normal School; the University of Wisconsin–Milwaukee, formerly Milwaukee Normal School; and Missouri State University, formerly Southwest Missouri State Teachers College. States generally charge higher tuition to out-of-state students. The higher fees are based on the theory that students from the state, or much more often their parents, have contributed to subsidizing the university by paying state taxes, while out-of-state students and their parents have not. It has never been determined whether the Washington, D.C. (1815), and was later followed by other colleges and universities in the District of Columbia, including Gallaudet University (1864), Howard University (1867), and American University (1893). Historically, many of the prestigious universities in the United States have been private. Some public universities are also highly prestigious and increasingly selective though; Richard Moll designated such prestigious public universities Public Ivies. At schools like the University of Michigan, UCLA, the University of California, Berkeley, the University of Texas at Austin, the University of Virginia, the University of Wisconsin-Madison, the College of William and Mary, and the University of North Carolina at Chapel Hill, a vast majority of the departments are consistently highly ranked. Public universities generally rely on subsidies from their respective state government. "The historical data for private and public institutions reveal that public institutions have always been more dependent on external support than have private institutions." Recently, state support of public universities has been declining, forcing many public universities to seek private support. The real level of state funding for public higher education has doubled from $30 billion in 1974 to nearly $60 billion in 2000. Meanwhile, the percent of state appropriations for the cost of schooling per student at public university has fallen from 78% in 1974 to 43% in 2000. The increasing use of teaching assistants in public universities is a testament to waning state support. To compensate, some professional graduate programs in law, business, and medicine rely almost solely on private funding. There are a number of public liberal arts colleges, including the members of the Council of Public Liberal Arts Colleges. 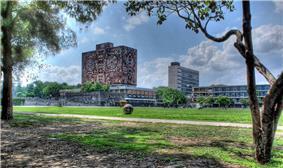 In Mexico, the UNAM (Universidad Nacional Autónoma de México), sometimes simply known as the "National University of Mexico", was founded in 1910. It is the largest university in the country and one of the largest in the world with over 250,000 students including its system of high schools. By percentage, it contributes the most to the country's academic research and cultural development although there are other significant public institutions such as the Instituto Politécnico Nacional, and the federal state-run universities. In Australia, there are 37 public universities and 3 private universities. 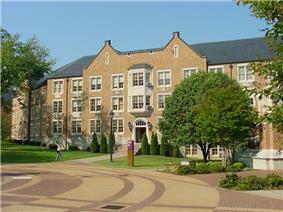 The private universities are Bond University and the University of Notre Dame Australia. There are also two foreign universities, Carnegie Mellon University (USA) and Cranfield University (UK), which have campuses in Adelaide. Some of the Group of Eight are the oldest and prestigious public universities in Australia and include the Universities of Queensland, Sydney, Melbourne, New South Wales, Adelaide and Western Australia together with the Australian National University and Monash University. Three were established in the 19th century. The Australian Technology Network universities largely grew from the former Institutes of Technology and include RMIT University, Queensland University of Technology, Curtin University, the University of Technology Sydney and the University of South Australia. They gained university status in the late 1980s to the early 1990s as a result of the reforms of the then Minister for Employment, Education and Training, John Dawkins. Innovative Research Universities represent a number of research-intensive institutions, with most being established in the 1960s and 1970s. The group includes Charles Darwin University, Flinders University, Griffith University, James Cook University, La Trobe University, Murdoch University and University of Newcastle. The Regional Universities Network is a group of six universities which mainly come from regional Australia, as well as campuses in the Australian capital cities and some international campuses. The group includes Central Queensland University, Southern Cross University, Federation University, the University of Southern Queensland, the University of the Sunshine Coast and the University of New England (Australia). In New Zealand, all eight universities are public. Public funding is supported by research grants. The oldest (University of Otago) was established in 1869 by Provincial Ordinance. From 1870 to 1961, there was effectively a single university structure - the University of New Zealand - with constituent colleges located in Auckland, Wellington, Christchurch and Dunedin. In 1961, the constituent colleges were dissolved into four independent universities by the New Zealand Parliament to become the University of Auckland, Victoria University of Wellington, University of Canterbury and University of Otago. This change also established a new university in Hamilton, the University of Waikato. 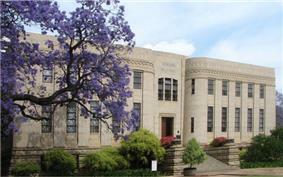 Two associated agricultural colleges - Massey and Lincoln - subsequently become universities in 1963 and 1990 respectively. An eighth university (Auckland University of Technology) was formed in 2000 by an Order in Council under the Education Act 1989. 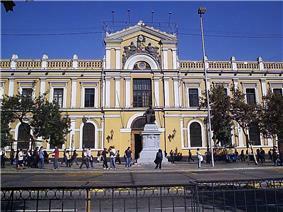 The University of Buenos Aires is a public university in Argentina. 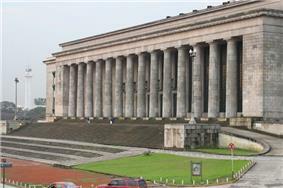 In Argentina the National Universities, also called "Public or State-run Universities", is the name used to refer to all those institutions whose creation arose from the enactment of a National Congress Act, except for those whose creation preceded that of the state itself (as is the case of the National University of Córdoba and the University of Buenos Aires). They lie as Public Law legal entities and their regular operation funding comes from the national state, pursuant to what is set out on the annual national budget act. National universities hold the largest share of the entire Argentine university system: counting over 80% of the undergraduate population and with campuses stretched throughout to all provinces comprising the national territory, they account for over 50% of the country's scientific research while additionally providing technical assistance to both the public and private sectors. Public universities are absolutely free (no fee is paid during the studies), as is the access to books in the universities' libraries. Buying in bookstores and studying material (such as photocopies of books which are very common) is, however, usually paid for by each student. For low-income students there is a great variety of scholarships. In Brazil, there are a few hundred public universities funded by the Federal or State governments, and they include the most renowned universities in the country, such as the Universidade Presbiteriana Mackenzie of São Paulo and the Pontifical Catholic University of Rio de Janeiro. Public universities are responsible for granting nearly all the graduate degrees in Brazil, such as doctoral and masters (called in Portuguese, respectivelly, "doutorado" and "mestrado"). These graduate programs in public universities are also the main source of Brazilian academic research. There are no tuition or entrance fees in public universities (a right established in the Brazilian Federal Constitution), but since they have thousands of applicants every year, because there are no tuitions or fees, only the best students can pass the entrance examination. In many Universities, there are quotas for students whose secondary (high school) education was made entirely in a public funded school (generally, the quota is 50%), and there are also racial quotas, but usually restricted to students from public high school too. Some Universities, like UFMG, the largest federal university in Brazil, give extra points in their admission tests instead of quotas. In UFMG a public high school student is granted a 10% bonus over his test grade, if he previously agrees to receive this advantage. Public school students that declare themselves as blacks or "pardos" (mixed race) have a 15% bonus, also if they previously agree to receive race based benefits. In recent years public funded higher education has grown a lot. Since 2005 the Brazilian Government has been offering a limited number of tuition grants to enable poor students to attend private universities. In Chile, older, so called "traditional" universities are more prestigious than the ones created after 1980. Even though some of those "traditional" universities are non-profit private entities, they belong to same superior university council called Consejo de Rectores (Council of Chancellors); the Consejo de Rectores runs its own admission system called Prueba de Selección Universitaria or PSU, which is roughly similar to SAT. Even though state run universities are much cheaper than the private ones, they are not tuition free for the students. It is remarkable that Chile spends only 4% in education, compared to the 7% of GDP recommended by the UN for developed nations. And in Chile the financing of higher education, private and public, is contributed by 75% by self-effort of families. The most prestigious universities in Chile are the state run Universidad de Chile, the private with State contributions Pontificia Universidad Católica de Chile, the private with State contributions Universidad de Concepción and the private with state contributions Universidad Técnica Federico Santa María, these four universities admit the largest numbers of high scoring students in the PSU admission test and are responsible for the largest portion of research (with the Universidad de Chile at the top). The non-traditional universities are, the most part, for-profit universities, and, with a few exceptions, don't have the same prestige as the above "traditional" ones. In Costa Rica the Universidad de Costa Rica, the Universidad Nacional, the Universidad Estatal a Distancia, Universidad Técnica Nacional and the Instituto Tecnológico de Costa Rica, all public universities, are among the most prestigious institutions, while the UN-sponsored University for Peace and the INCAE Business School (with campuses in Nicaragua and Costa Rica) are equally notable. 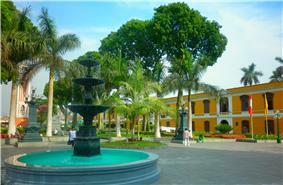 The historical campus of the National University of San Marcos. In Peru, the admission test required to enter national (public) universities requires higher scores. 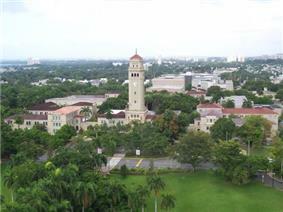 The public opinion sees this from the four century old National University of San Marcos (the oldest university of the Americas, founded in May 1551), that it has seen as the most respected public education institution in the country. Also many other public universities follow the same rigorous pattern used at San Marcos university, like National Agrarian University, the National University of Engineering and Federico Villarreal University. Historical Quadrangle, University of Puerto Rico, Río Piedras Campus. ^ World University Rankings 2010–2011. Times Higher Education. Retrieved on 2013-07-17. ^ "FY2003 White Paper on Education, Culture, Sports, Science and Technology [1.2.1.3]". 2003. Retrieved 2008-02-11. ^ 平成19年度学生納付金調査結果－文部科学省 (in Japanese). Retrieved 2008-02-11. ^ GMA NEWS.TV, RP universities get low rankings; La Salle, UST dropped out of Top 500. Accessed August 19, 2008. ^ Study In Turkey. Study In Turkey. Retrieved on 2013-07-17. ^ Paton, Graeme (5 January 2012). "'"Taxpayer funding of universities 'to drop to 100 year low. The Telegraph. Retrieved 6 January 2012. ^ "Annual Report and Financial Statements as at 31 July 2014" (PDF). 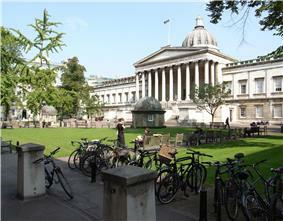 University College London. ^ "Financial Statements 2013-14" (PDF). Durham University. ^ "2013/14 Financial statement" (PDF). University of Hertfordshire. ^ Black, Andrew. (2011-10-03) BBC News - Scots universities set tuition fee rates. Bbc.co.uk. Retrieved on 2013-07-17. ^ Kiener, Robert. "Future of Public Universities". CQ Research. ^ Martin, Robert E. "Why Tuition Costs Are Rising So Quickly." Challenge Volume 45, Number 4 (2002): pp. 88-108. JSTOR. Web. 13 Mar. 2012. ^ Rizzo, Michael J. "State Preferences for Higher Education Spending: A Panel Data Analysis, 1977–2001." What's Happening to Public Higher Education? Ed. Ronald G. Ehrenberg. Westport: Praeger Publishers, 2006. pp. 3-35. ^ Bettinger, Eric P. and Bridget Terry Long. "The Increasing Use of Adjunct Instructors at Public Institutions: Are We Hurting Students?" What's Happening to Public Higher Education? Ed. Ronald G. Ehrenberg. Westport: Praeger Publishers, 2006. pp. 51-69. Print. ^ Group of Eight. "The Australian Higher Education System". ^ New Zealand Legislation. Legislation.govt.nz. Retrieved on 2013-07-17.